The Affordable Care Act (ACA) expands Medicaid eligibility to nearly all non-elderly adults with incomes up to 138 percent of the federal poverty level ($15,856 per year for an individual in 2013).1 As states continue to weigh whether to implement the ACA’s Medicaid expansion,2 two states have submitted proposals involving premium assistance. Arkansas and Iowa seek to use Medicaid funds to purchase coverage for some or all newly eligible Medicaid beneficiaries in Qualified Health Plans (QHPs) in the new Marketplaces (formerly called Exchanges) created by the ACA. While Arkansas and Iowa are applying for Section 1115 demonstration waiver authority to implement their premium assistance proposals,3 the Centers for Medicare and Medicaid Services (CMS) recently finalized regulations that permit states to use Medicaid funds as premium assistance through a state plan option, instead of through a waiver.4 This fact sheet compares the two premium assistance authorities and identifies key beneficiary protections in Medicaid expansion premium assistance programs. Cost-Sharing: Under both authorities, the state Medicaid agency must provide “wrap-around” cost-sharing assistance, to the extent that the private plan requires cost-sharing that exceeds Medicaid limits, so that beneficiaries do not have greater cost-sharing obligations than they would if they were covered directly through their state’s Medicaid program. Financing: Premium assistance programs must be “cost-effective.” This means that the total cost of providing Medicaid through premium assistance must be comparable to the cost of providing direct coverage through the Medicaid state plan. Under long-standing policy, Section 1115 demonstrations also must be “budget neutral,” meaning that the federal government’s costs must not exceed what they would have been without the premium assistance demonstration. Enrollment: One of the most significant differences between the two authorities is that enrollment must be voluntary for beneficiaries in premium assistance programs authorized under the state plan option. By contrast, enrollment in premium assistance programs can be mandatory in Section 1115 demonstrations, provided that beneficiaries have a choice of at least two health plans. Target Population: Premium assistance can be offered to any Medicaid beneficiary under the state plan option authority. HHS’s guidance provides that Section 1115 premium assistance demonstrations should be limited to beneficiaries who are eligible for Medicaid benefits packages that are “closely aligned” with the Marketplace QHP benefits package. HHS’s guidance also indicates that Section 1115 premium assistance demonstrations should not include beneficiaries who are exempt from Medicaid Alternative Benefit Plan (ABP) coverage, such as people who are medically frail. Duration: Premium assistance programs under the state plan option authority are not time-limited. HHS’s guidance indicates that Section 1115 Medicaid expansion premium assistance demonstrations must end by December 2016. This is because lessons from these demonstrations will be used to inform the use of the new State Innovation demonstration waiver authority, which becomes available in 2017. 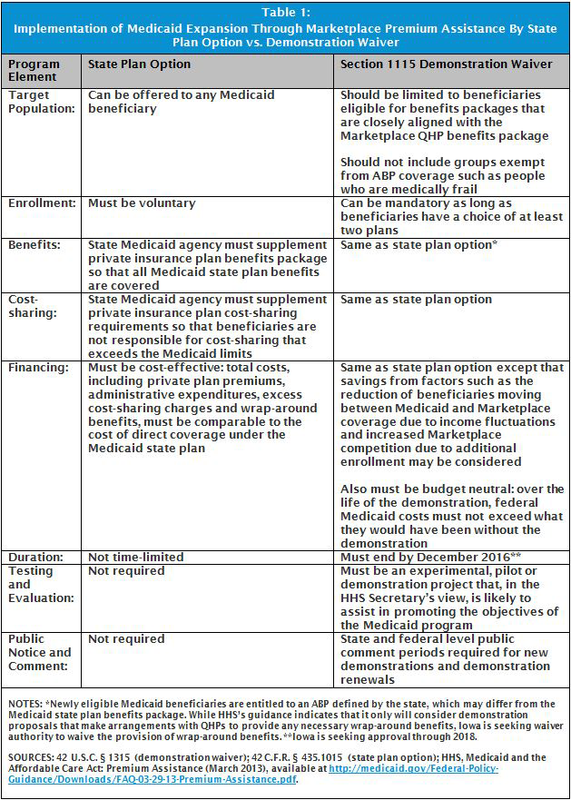 Evaluation: The state plan option authority does not require any evaluation of state premium assistance programs.8 Because all programs implemented under Section 1115 authority must be experimental, pilot or demonstration programs that, in the HHS Secretary’s view, are likely to assist in promoting the objectives of the Medicaid Act, Section 1115 premium assistance demonstrations must identify hypotheses that will be tested and evaluate the demonstration’s effectiveness in achieving those aims. Plan choice and enrollment options counseling: In order for beneficiaries in Medicaid premium assistance programs to compare health plans and make an informed choice about whether to participate in premium assistance (if enrollment is voluntary) and which plan best meets their needs, it is important that they have access to adequate information that is easy to understand. Enrollment options counseling from organizations that are trusted by beneficiaries and independent of participating health plans is an important means of supporting beneficiaries as they exercise their choices. Identification of exempt populations: In Medicaid expansion premium assistance demonstrations where enrollment is mandatory, the method by which the state will identify beneficiaries who exempt from mandatory ABP enrollment, such as people who are medically frail, will be an critical factor in ensuring that beneficiaries have access to the benefits package that best meets their needs and to which they are entitled. Access to wrap-around benefits and cost-sharing: A Government Accountability Office analysis of Medicaid premium assistance programs noted that “a reported issue with premium assistance programs is that there may be disparities in the benefits and cost-sharing protections offered to enrollees in such programs compared with those in direct [Medicaid] coverage.”10 As confirmed in CMS’s recent regulations and guidance, beneficiaries in premium assistance programs are entitled to wrap-around benefits and cost-sharing assistance, and this coverage should be “seamless.” The methods by which states offer wrap-around benefits and cost-sharing protections to beneficiaries in premium assistance programs are key determinants of whether beneficiaries will know about these program elements and how easily beneficiaries can access them. Appeals of service denials: Medicaid beneficiaries have a constitutionally protected right to adequate notice of service denials and the opportunity for a hearing to review denials of coverage.11 Ensuring that beneficiaries in premium assistance programs can exercise their appeal rights is an essential beneficiary protection. State Medicaid agency program oversight: Proper oversight of Medicaid premium assistance programs is an important means of evaluating their effectiveness. State Medicaid agencies will have to establish relationships with health plans to facilitate enrollment, pay premiums, and provide for wrap-around benefits and cost-sharing assistance. In addition, state oversight of Medicaid premium assistance programs in areas such as whether demonstration goals are being achieved, whether program funds are being spent cost-effectively, whether health plan provider networks are adequate to meet beneficiary needs, how services are being utilized, and how readily beneficiaries are able to access necessary care will be important to ensuring that the program is working effectively for beneficiaries. The ACA expands Medicaid eligibility to 133% FPL and includes an income disregard of 5% FPL, effectively making the income limit 138% FPL. 42 U.S.C. § 1396a(e)(14)(I). The Supreme Court’s ruling on the ACA maintains the Medicaid expansion but limits the Secretary’s authority to enforce it, effectively making implementation of the expansion a state choice. If a state does not implement the expansion, the Secretary cannot withhold existing federal program funds. Kaiser Commission on Medicaid and the Uninsured, Implementing the ACA’s Medicaid-Related Health Reform Provisions After the Supreme Court’s Decision (Aug. 2012), available at http://kff.org/health-reform/issue-brief/implementing-the-acas-medicaid-related-health-reform/. For more information about state implementation of the ACA’s Medicaid expansion, see Kaiser Commission on Medicaid and the Uninsured, Status of State Action on the Medicaid Expansion Decision, as of July 1, 2013, available at http://www.kff.org/medicaid/state-indicator/state-activity-around-expanding-medicaid-under-the-affordable-care-act/. Kaiser Commission on Medicaid and the Uninsured, Medicaid Expansion Through Premium Assistance: Arkansas and Iowa’s Section 1115 Demonstration Waiver Applications Compared (Sept. 2013), available at http://www.kff.org/health-reform/fact-sheet/medicaid-expansion-through-premium-assistance-arkansas-and-iowas-section-1115-demonstration-waiver-applications-compared/. HHS, Medicaid and the Affordable Care Act: Premium Assistance (March 2013), available at http://www.medicaid.gov/Federal- Policy-Guidance/Downloads/FAQ-03-29-13-Premium-Assistance.pdf. Typically, Medicaid beneficiaries receive the services in their Medicaid state plan benefits package. The ACA provides that newly eligible Medicaid beneficiaries under the expansion are entitled to the services in an Alternative Benefit Plan (ABP) package. States have the option to align their ABP with their Medicaid state plan benefits package. See generally 42 C.F.R. § § 440.305-440.386. Responses from state officials in 34 out of 45 premium assistance programs surveyed by the Government Accountability Office in 2009 revealed that “they did not monitor access to care or utilization of services for individuals enrolled in the premium assistance programs.” GAO, Enrollment, Benefits, Expenditures, and Other Characteristics of State Premium Assistance Programs, GAO-10-258R at 9 (Jan. 19, 2010), available at http://www.gao.gov/new.items/d10258r.pdf. For more information, see Kaiser Commission on Medicaid and the Uninsured, The New Review and Approval Process Rule for Section 115 Medicaid and CHIP Demonstration Waivers (March 2012), available at http://www.kff.org/health-reform/fact-sheet/the-new-review-and-approval-process-rule/. GAO, Enrollment, Benefits, Expenditures, and Other Characteristics of State Premium Assistance Programs, GAO-10-258R at 2 (Jan. 19, 2010), available at http://www.gao.gov/new.items/d10258r.pdf. For more information about Medicaid appeals, see Kaiser Commission on Medicaid and the Uninsured, A Guide to the Medicaid Appeals Process (March 2012), available at http://www.kff.org/medicaid/issue-brief/a-guide-to-the-medicaid-appeals-process/.